Your smartphone’s camera is perfect for taking fancy pictures on the go and for video recording, but you surely can use the camera for a bunch of other useful things you maybe didn’t even think about. Your smartphone basically works as a portable document scanner. You can take pictures of documents, letters and payment receipts, convert them to a PDF file and optionally browse or edit this file with OCR (text recognition software). You can also use a free app named CamScanner (iOS/Android) , which is specifically made for scanning. The freely available Google Drive app (iOS/Android) also has a scanning feature. With this app, you can save the scanned document as a PDF file and put it in your Google drive immediately, you can search it later on with OCR. It might be a good idea to take pictures of the equipment you receive when you hire something (a car, gardening tools) . This avoids discussions about possible damages later on. The same thing goes for something you bought online: always take pictures of the damage to a package or its contents before you send a complaint to a web store. Need A Magnifying Glass Or A Mirror? Do you want to look at something up close? The back camera of your smartphone can serve as a magnifying glass. 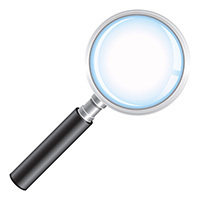 With an iOS app like Magnifying Glass With Light or an Android app like Magnifier HD, it’s possible to zoom in on something or take a picture. Need a mirror? With the front camera of your smartphone, it’s possible to look whether your hair looks all right, look underneath something (e.g your car) or look discretely at what’s happening behind your back. What Did The Screen Say? A monitor screen sometimes shows important information of which you can’t make a copy. An error message on your computer, an error message from a failing vending machine that doesn’t give back your money,…: take a picture to back up your complaint. Where Do I Find This Cheaper? Are you unsure whether you should buy a book, cd or dvd in a particular store? You can scan a barcode or take a picture of the desired product and see whether or not it’s cheaper in an Amazon store with the free Price Check app by Amazon. How do you put it back together? When you take apart a closet which you are planning on putting back together later on, it’s important to take a picture of every step of the disassembly. It’ll be a very simple assembly later on when you know where each part belongs. If you have another great tip or way you use your smartphone’s camera, please share with us in the comments below. Thanks for the tips Rebekka! One to add: public maps of the unknown environment/city where you are. In many places one runs into unexpected city- or environment maps displayed on a signboard. You take a shot and carry a copy of the map with you. Thank you Henk for this great tip! Some inventive uses of the camera phone! I didn’t know about the Google Drive app’s ability to scan!! Will have to check that out, sounds very useful. It can be very useful indeed. Thank you for your kind comment Josh.